Brooks, Victor (1999). How America Fought Its Wars. New York: De Capo Press. ISBN 1580970028. Burt, Daniel S. (2001). The Biography Book. New York: Oryx Press. ISBN 1573562564. Elson, William Henry (1908). History of the United States of America. Macmillan. Ferling, John (2007). Almost a Miracle. Oxford University Press. ISBN 0195181212. Fischer, David Hackett (2006). 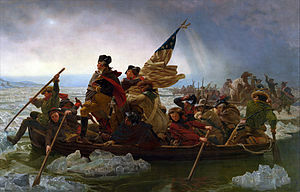 Washington's Crossing. Oxford University Press. ISBN 0195170342. Mitchell, Craig (2003). George Washington's New Jersey. Middle Atlantic Press. ISBN 097058041X. http://books.google.com/books?id=7VgXM1w0e80C&dq=George+Washington%27s+New+Jersey&ei=jUesSOW_MZjgiQGCqqH6BA. Rosenfeld, Lucy (2007). George Washington's New Jersey. Rutgers. ISBN 0813539692. Savas, Theodore (2003). Guide to the Battles of the American Revolution. Savas Beatie. ISBN 193271412X. Scheer, George (1987). Rebels and Redcoats. Da Capo Press. ISBN 0306803070. http://books.google.com/books?id=ROz4g9_bspAC&dq=Rebels+and+Redcoats&ei=3UesSMiqAZSSjgH9nMj6BA. Stanhope, Phillip Henry (1854). History of England: From the Peace of Utrecht to the Peace of Versailles. GB, Murray. Wood, W.J Henry (2003). Battles Of The Revolutionary War. Da Capo Press. ISBN 0306813297. http://books.google.com/books?id=WnJr_IpqunoC&dq=Battles+Of+The+Revolutionary+War+henry+wood&ei=kUisSPmDEaaijgGGp4SaBQ.